Yes! We may send a delivery driver or use a mailing system. Delivery is FREE and worth it! Can my prescriptions be delivered with my over-the-counter products? Of course your prescriptions can be delivered with your additional products. Simply leave us a note at checkout with your prescription number. We will take care of the rest. EASY!! Not every person is the same or has the same needs. Compounding a prescription means to create a particular pharmaceutical product to fit your unique needs. It can change the form of the medication from a solid pill, to a liquid or cream. It may also be done for optional reasons, such as adding flavors to a medication or otherwise altering taste or texture. A few of the many products that we formulate provide HORMONE THERAPY for men and women, and meet the special VETERINARY needs of animals. How much will my prescription cost if I am paying cash? If I have insurance? Pricing information varies depending on the prescription and any co-pay amounts as required by your insurance. We will always be glad to give you a price check first – just ask! 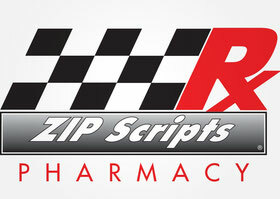 How do I transfer my prescription to ZIP Scripts Pharmacy? Transferring a prescription is easy! Our pharmacist will collect the necessary information and complete the prescription transfer for you – no worries! How do I know if ZIP Scripts carries a particular product? If a product is not in stock, our pharmacist is able to place a special order just for you! Does ZIP Scripts carry medications for my pet? Yes! We can even make the medications with special meat flavors. We love to help your furry friends. I am feeling better - can I stop taking my antibiotic? Continue to take your antibiotic as directed by your physician until the entire prescribed amount is finished - even if symptoms disappear after a few days. By stopping the medication too early, it may allow bacteria to continue to grow, which may result in a relapse of the infection. What is the difference between a "brand" and a "generic" medication? When a new product is introduced to the market, the manufacturer assigns it a brand, or trade, name. Once the patent rights to the product expire, other companies are free to manufacture generic versions of the product - provided they meet all the requirements the FDA requires of the brand name drug. Generic drugs are regulated by the FDA just like the brand name drug and must meet the same stringent standards to ensure safety and efficacy for their intended uses. A generic substitution must be specified by the prescribing physician. We are always happy to accept your prescription and speak with your insurance company about your needs and coverage amounts. Does ZIP Scripts offer mail order services? Yes! We have a mail order program that is generally used for maintenance medications, or drugs taken for a chronic medical condition. For more information on the ZIP Pack, click here.